Spiny dendrite of a striatal medium spiny neuron. Common types of dendritic spines. A dendritic spine (or spine) is a small membranous protrusion from a neuron's dendrite that typically receives input from a single axon at the synapse. Dendritic spines serve as a storage site for synaptic strength and help transmit electrical signals to the neuron's cell body. Most spines have a bulbous head (the spine head), and a thin neck that connects the head of the spine to the shaft of the dendrite. The dendrites of a single neuron can contain hundreds to thousands of spines. In addition to spines providing an anatomical substrate for memory storage and synaptic transmission, they may also serve to increase the number of possible contacts between neurons. Dendritic spines were first described at the end of the 19th century by Santiago Ramón y Cajal on cerebellar neurons. Ramón y Cajal then proposed that dendritic spines could serve as contacting sites between neurons. This was demonstrated more than 50 years later thanks to the emergence of electron microscopy. Until the development of confocal microscopy on living tissues, it was commonly admitted that spines were formed during embryonic development and then would remain stable after birth. In this paradigm, variations of synaptic weight were considered as sufficient to explain memory processes at the cellular level. But since about a decade ago, new techniques of confocal microscopy demonstrated that dendritic spines are indeed motile and dynamic structures that undergo a constant turnover, even after birth. 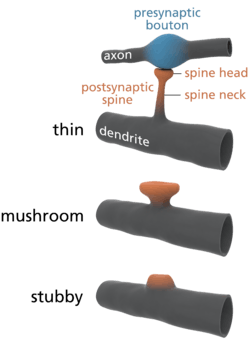 Dendritic spines usually receive excitatory input from axons although sometimes both inhibitory and excitatory connections are made onto the same spine head. Spines are found on the dendrites of most principal neurons in the brain, including the pyramidal neurons of the neocortex, the medium spiny neurons of the striatum, and the Purkinje cells of the cerebellum. 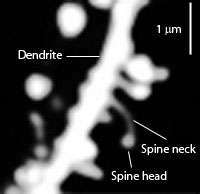 Dendritic spines are small with spine head volumes ranging 0.01 µm3 to 0.8 µm3. Spines with strong synaptic contacts typically have a large spine head, which connects to the dendrite via a membranous neck. The most notable classes of spine shape are "thin", "stubby", "mushroom", and "branched". Electron microscopy studies have shown that there is a continuum of shapes between these categories. The variable spine shape and volume is thought to be correlated with the strength and maturity of each spine-synapse. Dendritic spines express glutamate receptors (e.g. AMPA receptor and NMDA receptor) on their surface. The TrkB receptor for BDNF is also expressed on the spine surface, and is believed to play a role in spine survival. The tip of the spine contains an electron-dense region referred to as the "postsynaptic density" (PSD). The PSD directly apposes the active zone of its synapsing axon and comprises ~10% of the spine's membrane surface area; neurotransmitters released from the active zone bind receptors in the postsynaptic density of the spine. One-half of the synapsing axons and dendritic spines are physically tethered by calcium-dependent cadherin, which forms cell-to-cell adherent junctions between two neurons. Glutamate receptors (GluRs) are localized to the postsynaptic density, and are anchored by cytoskeletal elements to the membrane. They are positioned directly above their signalling machinery, which is typically tethered to the underside of the plasma membrane, allowing signals transmitted by the GluRs into the cytosol to be further propagated by their nearby signalling elements to activate signal transduction cascades. The localization of signalling elements to their GluRs is particularly important in ensuring signal cascade activation, as GluRs would be unable to affect particular downstream effects without nearby signallers. Signalling from GluRs is mediated by the presence of an abundance of proteins, especially kinases, that are localized to the postsynaptic density. These include calcium-dependent calmodulin, CaMKII (calmodulin-dependent protein kinase II), PKC (Protein Kinase C), PKA (Protein Kinase A), Protein Phosphatase-1 (PP-1), and Fyn tyrosine kinase. Certain signallers, such as CaMKII, are upregulated in response to activity. Spines are particularly advantageous to neurons by compartmentalizing biochemical signals. This can help to encode changes in the state of an individual synapse without necessarily affecting the state of other synapses of the same neuron. The length and width of the spine neck has a large effect on the degree of compartmentalization, with thin spines being the most biochemically isolated spines. The cytoskeleton of dendritic spines is particularly important in their synaptic plasticity; without a dynamic cytoskeleton, spines would be unable to rapidly change their volumes or shapes in responses to stimuli. These changes in shape might affect the electrical properties of the spine. The cytoskeleton of dendritic spines is primarily made of filamentous actin (F-actin). tubulin Monomers and microtubule-associated proteins (MAPs) are present, and organized microtubules are present. Because spines have a cytoskeleton of primarily actin, this allows them to be highly dynamic in shape and size. The actin cytoskeleton directly determines the morphology of the spine, and actin regulators, small GTPases such as Rac, RhoA, and CDC42, rapidly modify this cytoskeleton. Overactive Rac1 results in consistently smaller dendritic spines. In addition to their electrophysiological activity and their receptor-mediated activity, spines appear to be vesicularly active and may even translate proteins. Stacked discs of the smooth endoplasmic reticulum (SERs) have been identified in dendritic spines. Formation of this "spine apparatus" depends on the protein synaptopodin and is believed to play an important role in calcium handling. "Smooth" vesicles have also been identified in spines, supporting the vesicular activity in dendritic spines. The presence of polyribosomes in spines also suggests protein translational activity in the spine itself, not just in the dendrite. As aforementioned, dendritic spines are very "plastic", that is, spines change significantly in shape, volume, and number in small time courses. Because spines have a primarily actin cytoskeleton, they are dynamic, and the majority of spines change their shape within seconds to minutes because of the dynamicity of actin remodeling. Furthermore, spine number is very variable and spines come and go; in a matter of hours, 10-20% of spines can spontaneously appear or disappear on the pyramidal cells of the cerebral cortex, although the larger "mushroom"-shaped spines are the most stable. Spine maintenance and plasticity is activity-dependent and activity-independent. BDNF partially determines spine levels, and low levels of AMPA receptor activity is necessary to maintain spine survival, and synaptic activity involving NMDA receptors encourages spine growth. Furthermore, two-photon laser scanning microscopy and confocal microscopy have shown that spine volume changes depending on the types of stimuli that are presented to a synapse. Spine plasticity is implicated in motivation, learning, and memory. In particular, long-term memory is mediated in part by the growth of new dendritic spines (or the enlargement of pre-existing spines) to reinforce a particular neural pathway. Because dendritic spines are plastic structures whose lifespan is influenced by input activity, spine dynamics may play an important role in the maintenance of memory over a lifetime. Age-dependent changes in the rate of spine turnover suggest that spine stability impacts developmental learning. In youth, dendritic spine turnover is relatively high and produces a net loss of spines. This high rate of spine turnover may characterize critical periods of development and reflect learning capacity in adolescence—different cortical areas exhibit differing levels of synaptic turnover during development, possibly reflecting varying critical periods for specific brain regions. In adulthood, however, most spines remain persistent, and the half-life of spines increases. This stabilization occurs due to a developmentally regulated slow-down of spine elimination, a process which may underlie the stabilization of memories in maturity. Experience-induced changes in dendritic spine stability also point to spine turnover as a mechanism involved in the maintenance of long-term memories, though it is unclear how sensory experience affects neural circuitry. Two general models might describe the impact of experience on structural plasticity. On the one hand, experience and activity may drive the discrete formation of relevant synaptic connections that store meaningful information in order to allow for learning. On the other hand, synaptic connections may be formed in excess, and experience and activity may lead to the pruning of extraneous synaptic connections. Conversely, while enrichment and training are related to increases in spine formation and stability, long-term sensory deprivation leads to an increase in the rate of spine elimination and therefore impacts long-term neural circuitry. Upon restoring sensory experience after deprivation in adolescence, spine elimination is accelerated, suggesting that experience plays an important role in the net loss of spines during development. In addition, other sensory deprivation paradigms—such as whisker trimming—have been shown to increase the stability of new spines. Research in neurological diseases and injuries shed further light on the nature and importance of spine turnover. After stroke, a marked increase in structural plasticity occurs near the trauma site, and a five- to eightfold increase from control rates in spine turnover has been observed. Dendrites disintegrate and reassemble rapidly during ischemia—as with stroke, survivors showed an increase in dendritic spine turnover. While a net loss of spines is observed in Alzheimer's disease and cases of intellectual disability, cocaine and amphetamine use have been linked to increases in dendritic branching and spine density in the prefrontal cortex and the nucleus accumbens. Because significant changes in spine density occur in various brain diseases, this suggests a balanced state of spine dynamics in normal circumstances, which may be susceptible to disequilibrium under varying pathological conditions. There is also some evidence for loss of dendritic spines as a consequence of aging. One study using mice has noted a correlation between age-related reductions in spine densities in the hippocampus that and age-dependent declines in hippocampal learning and memory. Despite experimental findings that suggest a role for dendritic spine dynamics in mediating learning and memory, the degree of structural plasticity’s importance remains debatable. For instance, studies estimate that only a small portion of spines formed during training actually contribute to lifelong learning. In addition, the formation of new spines may not significantly contribute to the connectivity of the brain, and spine formation may not bear as much of an influence on memory retention as other properties of structural plasticity, such as the increase in size of spine heads. Theoreticians have for decades hypothesized about the potential electrical function of spines, yet our inability to examine their electrical properties has until recently stopped theoretical work from progressing too far. Recent advances in imaging techniques along with increased use of two-photon glutamate uncaging have led to a wealth of new discoveries; we now suspect that there are voltage-dependent sodium, potassium, and calcium channels in the spine heads. Cable theory provides the theoretical framework behind the most "simple" method for modelling the flow of electrical currents along passive neural fibres. Each spine can be treated as two compartments, one representing the neck, the other representing the spine head. The compartment representing the spine head alone should carry the active properties. To facilitate the analysis of interactions between many spines, Baer & Rinzel formulated a new cable theory for which the distribution of spines is treated as a continuum. In this representation, spine head voltage is the local spatial average of membrane potential in adjacent spines. The formulation maintains the feature that there is no direct electrical coupling between neighboring spines; voltage spread along dendrites is the only way for spines to interact. The SDS model was intended as a computationally simple version of the full Baer and Rinzel model. It was designed to be analytically tractable and have as few free parameters as possible while retaining those of greatest significance, such as spine neck resistance. The model drops the continuum approximation and instead uses a passive dendrite coupled to excitable spines at discrete points. Membrane dynamics in the spines are modelled using integrate and fire processes. The spike events are modelled in a discrete fashion with the wave form conventionally represented as a rectangular function. Calcium transients in spines are a key trigger for synaptic plasticity. NMDA receptors, which have a high permeability for calcium, only conduct ions if the membrane potential is suffiently depolarized. The amount of calcium entering a spine during synaptic activity therefore depends on the depolarization of the spine head. Evidence from calcium imaging experiments (two-photon microscopy) and from compartmental modelling indicates that spines with high resistance necks experience larger calcium transients during synaptic activity. Dendritic spines can develop directly from dendritic shafts or from dendritic filopodia. During synaptogenesis, dendrites rapidly sprout and retract filopodia, small membrane organelle-lacking membranous protrusions. Recently,I-BAR protein MIM was found to contribute to the initiation process. During the first week of birth, the brain is predominated by filopodia, which eventually develop synapses. However, after this first week, filopodia are replaced by spiny dendrites but also small, stubby spines that protrude from spiny dendrites. In the development of certain filopodia into spines, filopodia recruit presynaptic contact to the dendrite, which encourages the production of spines to handle specialized postsynaptic contact with the presynaptic protrusions. Spines, however, require maturation after formation. Immature spines have impaired signaling capabilities, and typically lack "heads" (or have very small heads), only necks, while matured spines maintain both heads and necks. Cognitive disorders such as ADHD, autism, intellectual disability, and fragile X syndrome, may be resultant from abnormalities in dendritic spines, especially the number of spines and their maturity. The ratio of matured to immature spines is important in their signaling, as immature spines have impaired synaptic signaling. Fragile X syndrome is characterized by an overabundance of immature spines that have multiple filopodia in cortical dendrites. In 2015 study published in Cell  by Jeff Lichtman lab at Harvard researchers describe automated technologies to probe the structure of neural tissue at nanometer resolution and use them to generate a saturated reconstruction of a sub-volume of mouse neocortex in which all cellular objects (axons, dendrites, and glia) and many sub-cellular components (synapses, synaptic vesicles, spines, spine apparati, postsynaptic densities, and mitochondria) are rendered and itemized in a database. By tracing the trajectories of all excitatory axons and noting their juxtapositions, both synaptic and non-synaptic, with every dendritic spine the study refutes the idea that physical proximity is sufficient to predict synaptic connectivity (the so-called Peters’ rule). ↑ Ramón y Cajal, S. Estructura de los centros nerviosos de las aves. Rev. Trim. Histol. Norm. Pat. 1, 1-10 (1888). ↑ GRAY, E. G. Electron microscopy of synaptic contacts on dendrite spines of the cerebral cortex. Nature 183, 1592-1593 (1959). ↑ Dailey, M. E. & Smith, S. J. The dynamics of dendritic structure in developing hippocampal slices. J Neurosci 16, 2983- 2994 (1996). ↑ Bonhoeffer, T. & Yuste, R. Spine motility. Phenomenology, mechanisms, and function. Neuron 35, 1019- 1027 (2002). 1 2 Yoshihara, Y., De Roo, M. & Muller, D. Dendritic spine formation and stabilization. Curr Opin Neurobiol (2009). ↑ De Roo, M., Klauser, P., Mendez, P., Poglia, L. & Muller, D. Activity-dependent PSD formation and stabilization of newly formed spines in hippocampal slice cultures. Cereb Cortex 18, 151-161 (2008). ↑ Kaneko M.; Xie Y.; An JJ. ; Stryker MP. ; Xu B. (2012). "Dendritic BDNF synthesis is required for late-phase spine maturation and recovery of cortical responses following sensory deprivation". J. Neurosci. 32 (14): 4790–4802. doi:10.1523/JNEUROSCI.4462-11.2012. 1 2 3 Xu, T.; Yu, X.; Perlik, A. J.; Tobin, W. F.; Zweig, J. A.; Tennant, K.; Jones, T.; Zuo, Y. (2009). "Rapid formation and selective stabilization of synapses for enduring motor memories". Nature. 462: 915–919. doi:10.1038/nature08389. PMC 2844762 . PMID 19946267. 1 2 3 Roberts, T.; Tschida, K.; Klein, M.; Mooney, R. (2010). "Rapid spine stabilization and synaptic enhancement at the onset of behavioural learning". Nature. 463 (7283): 948–952. doi:10.1038/nature08759. PMC 2918377 . PMID 20164928. ↑ Tschida, K. A.; Mooney, R. (2012). "Deafening drives cell-type-specific changes to dendritic spines in a sensorimotor nucleus important to learned vocalizations". Neuron. 73: 1028–1039. doi:10.1016/j.neuron.2011.12.038. PMC 3299981 . PMID 22405211. ↑ De Roo, M., Klauser, P. & Muller, D. LTP promotes a selective long-term stabilization and clustering of dendritic spines. PLoS Biol 6, e219 (2008). 1 2 3 4 5 6 Alvarez, V.; Sabatini, B. (2007). "Anatomical and Physiological Plasticity of Dendritic Spines". Annual Review of Neuroscience. 30: 79–97. doi:10.1146/annurev.neuro.30.051606.094222. PMID 17280523. 1 2 3 4 5 Zuo, Y.; Lin, A.; Chang, P.; Gan, W. B. (2005). "Development of long-term dendritic spine stability in diverse regions of cerebral cortex". Neuron. 46 (2): 181–189. doi:10.1016/j.neuron.2005.04.001. PMID 15848798. ↑ Holtmaat, A. J.; Trachtenberg, J. T.; Wilbrecht, L.; Shepherd, G. M.; Zhang, X.; et al. (2005). "Transient and persistent dendritic spines in the neocortex in vivo". Neuron. 45 (2): 279–291. doi:10.1016/j.neuron.2005.01.003. PMID 15664179. 1 2 3 Yang, G.; Pan, F.; Gan, W. B. (2009). "Stably maintained dendritic spines are associated with lifelong memories". Nature. 462 (7275): 920–924. doi:10.1038/nature08577. PMID 19946265. ↑ Holtmaat, A.; Wilbrecht, L.; Knott, G. W.; Welker, E.; Svoboda, K. (2006). "Experience-dependent and cell-type-specific spine growth in the neocortex". Nature. 441 (7096): 979–983. doi:10.1038/nature04783. PMID 16791195. ↑ Brown, C.; Li, P.; Boyd, J.; Delaney, K.; Murphy, T. (2007). "Extensive Turnover of Dendritic Spines and Vascular Remodeling in Cortical Tissues Recovering from Stroke". Journal of Neuroscience. 27 (15): 4101–4109. doi:10.1523/JNEUROSCI.4295-06.2007. PMID 17428988. ↑ Brown, C.; Murphy, T. H. (2008). "Livin' on the edge: imaging dendritic spine turnover in the peri-infarct zone during ischemic stroke and recovery". Neuroscientist. 14 (2): 139–146. doi:10.1177/1073858407309854. PMID 18039977. 1 2 Bhatt, D.; Zhang, S.; Gan, W. B. (2009). Dendritic Spine Dynamics. Annual Review of Physiology. 71. pp. 261–282. doi:10.1146/annurev.physiol.010908.163140. PMID 19575680. ↑ von Bohlen und Halbach O, Zacher C, Gass P, Unsicker K (2006). "Age-related alterations in hippocampal spines and deficiencies in spatial memory in mice". J Neurosci Res. 83: 525–531. doi:10.1002/jnr.20759. PMID 16447268. ↑ Harris, K.; Fiala, J.; Ostroff, L. (2003). "Structural Changes at Dendritic Spine Synapses during Long-Term Potentiation". Philosophical Transactions: Biological Sciences. 358 (1432): 745–748. doi:10.1098/rstb.2002.1254. PMC 1693146 . PMID 12740121. ↑ Araya, R.; Nikolenko, V.; Eisenthal, K. B.; Yuste, R. (2007). "Sodium channels amplify spine potentials". PNAS. 104 (30): 12347–12352. doi:10.1073/pnas.0705282104. PMC 1924793 . PMID 17640908. ↑ Ngo-Anh, T. J.; Bloodgood, B. L.; Lin, M.; Sabatini, B. L.; Maylie, J.; Adelman, J. P. (2005). "SK channels and NMDA receptors form a Ca2+-mediated feedback loop in dendritic spines". Nature Neuroscience. 8 (5): 642–649. doi:10.1038/nn1449. PMID 15852011. ↑ Yuste, R.; Denk, W. (1995). "Dendritic spines as basic functional units of neuronal integration". Nature. 375 (6533): 682–684. doi:10.1038/375682a0. PMID 7791901. ↑ Baer, S. M.; Rinzel, J. (1991). "Propagation of dendritic spikes mediated by excitable spines: a continuum theory". Journal of Neurophysiology. 65 (4): 874–890. PMID 2051208. ↑ Coombes, S.; Bressloff, P. C. (2000). "Solitary Waves in a Model of Dendritic Cable with Active Spines". SIAM Journal on Applied Mathematics. 61 (2): 432–453. doi:10.1137/s0036139999356600. JSTOR 3061734. ↑ Nevian, T.; Sakmann, B. (2006). "Spine Ca2+ signaling in spike-timing-dependent plasticity". Journal of Neuroscience. 26 (43): 11001–11013. doi:10.1523/JNEUROSCI.1749-06.2006. PMID 17065442. ↑ Grunditz, A.; Holbro, N.; Tian, L.; Zuo, Y.; Oertner, T. G. (2008). "Spine neck plasticity controls postsynaptic calcium signals through electrical compartmentalization". Journal of Neuroscience. 28 (50): 13457–13466. doi:10.1523/JNEUROSCI.2702-08.2008. PMID 19074019. ↑ Saarikangas, Juha, et al. "MIM-induced membrane bending promotes dendritic spine initiation." Developmental cell 33.6 (2015): 644-659. ↑ Penzes, P., Cahill, M. E., Jones, K. A., Vanleeuwen, J. E. & Woolfrey, K. M. Dendritic spine pathology in neuropsychiatric disorders. Nat Neurosci 14, 285-293 (2011). Sudhof, T. C.; Stevens, C. F.; Cowan, W. M. (2001). Synapses. Baltimore: The Johns Hopkins University Press. ISBN 0-8018-6498-4. Levitan, I. B.; Kaczmarek, L. K. (2002). The Neuron: Cell and Molecular Biology (Third ed.). New York: Oxford University Press. ISBN 0-19-514522-4. Nimchinsky E, Sabatini B, Svoboda K (2002). "Structure and function of dendritic spines". Annu Rev Physiol. 64: 313–53. doi:10.1146/annurev.physiol.64.081501.160008. PMID 11826272. Matsuzaki M, Honkura N, Ellis-Davies G, Kasai H (2004). "Structural basis of long-term potentiation in single dendritic spines". Nature. 429 (6993): 761–6. doi:10.1038/nature02617. PMID 15190253. Yuste R, Majewska A, Holthoff K (2000). "From form to function: calcium compartmentalization in dendritic spines". Nat Neurosci. 3 (7): 653–9. doi:10.1038/76609. PMID 10862697. Lieshoff C, Bischof H (2003). "The dynamics of spine density changes". Behav Brain Res. 140 (1–2): 87–95. doi:10.1016/S0166-4328(02)00271-1. PMID 12644282. Kasai H, Matsuzaki M, Noguchi J, Yasumatsu N (2002). "Dendritic spine structures and functions". Nihon Shinkei Seishin Yakurigaku Zasshi. 22 (5): 159–64. PMID 12451686. Lynch G, Rex CS, Gall CM (2007). "LTP consolidation: substrates, explanatory power, and functional significance". Neuropharmacology. 52 (1): 12–23. doi:10.1016/j.neuropharm.2006.07.027. PMID 16949110.